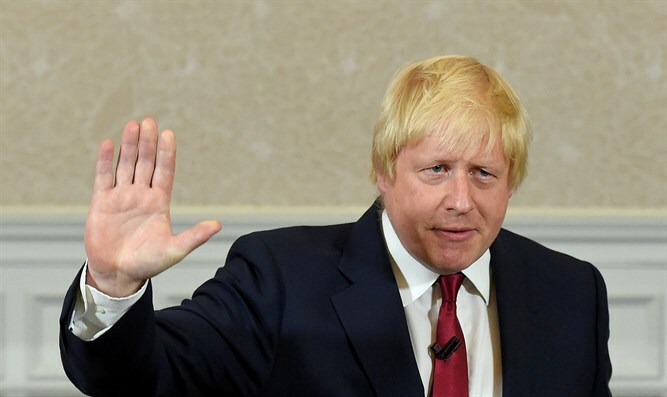 British Foreign Minister Boris Johnson arrived in Israel on Wednesday for talks Palestinian Authority leaders and Israeli ministers. Johnson was due to meet Israeli Prime Minister Benjamin Netanyahu in Jerusalem and Palestinian Authority Chairman Mahmoud Abbas in Ramallah during his first official visit as Britain's Foreign Minister. He met Israeli President Reuven Rivlin earlier on Wednesday is scheduled to speak with PA Department of Affairs Abroad Director Riyad al-Malki. There were also reports in Israeli media that Johnson would be briefed by foreign-funded anti-Israel NGO Peace Now, but there was no official confirmation. British Prime Minister Theresa May's government says it remains committed to a two-state solution and has criticized Israeli building in Judea and Samaria. Netanyahu met May in London in February, saying at the time that all "responsible nations" should back new sanctions against Iran.